For as long as I can remember, my family and I have followed the same exact routine for Christmas Eve and Christmas Day each year. Even as my brother and I grew older—and things like college, grad school and real, “adult” jobs came into the picture—we always stuck to our holiday traditions. That is, until last year. I won’t get into the details of what went awry this past December, but let’s just say I wasn’t happy about the idea of disrupting our annual traditions. But do you know what ended up happening? Once I finally let go of my resistance and accepted that things can’t always stay the same, I realized that it was one of the best holidays I’ve ever had. I made new traditions with my family and discovered that change can be a good thing! So what does this tale of Christmases past have to do with this post? Well, it should tip you off that I’m not a fan of change. I like the security of being comfortable in my routine—knowing what’s expected of me and what to expect. So when Henry, our director of marketing, wanted me to experiment with a new lead generation technique, I was of course a little hesitant. One of the “best practices” of inbound marketing is to include relevant calls-to-action (CTAs) in your blog posts. Typically, this is done by inserting a designed CTA within the body of each post prompting readers to interact with an offer (find more on what those are here), which is the rule of thumb we follow for our clients’ blog posts as well as our own. But a couple of months ago, Henry stumbled across HubSpot’s article How the HubSpot Marketing Blog Actually Generates Leads (Hint: It's Not How You Think), which introduced a new CTA concept. 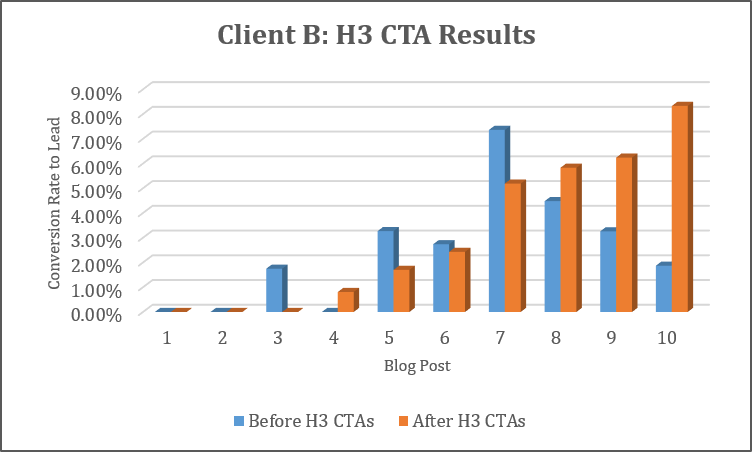 After HubSpot analyzed 11 of their blog posts, they discovered that “anchor text” or “H3” CTAs were responsible for the majority of their blog leads. According to the article, an H3 CTA is a standalone line of text linked to a landing page, styled as a subheader to make it stand out from the rest of the post’s body copy. So when I was asked to integrate this new kind of CTA into some blog posts, I immediately had my reservations. It didn’t matter that H3 CTAs were (extremely!) 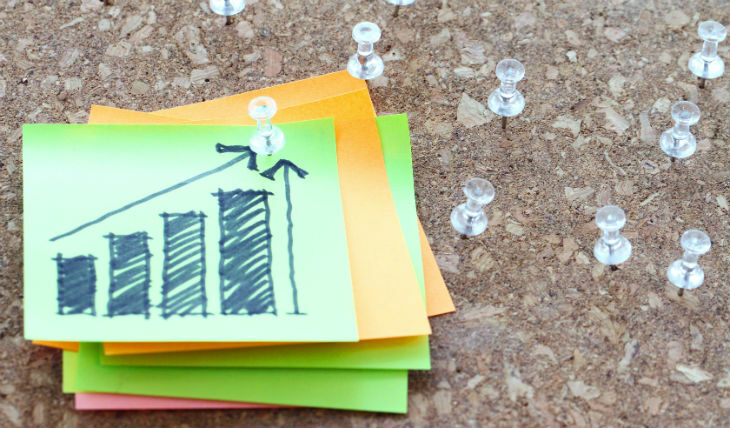 simple to implement or that HubSpot had experienced such positive results with them—it meant deviating from the norm and entering into uncharted territory. Well, as I learned this past winter, change can be positive. And as it turned out, switching up the way we displayed CTAs on blog posts was no exception—we have the results to prove it. We introduced H3 CTAs into three of our clients’ top blog posts (we’ll call these clients Client A, B, and C). We also put them in our own top blog posts. 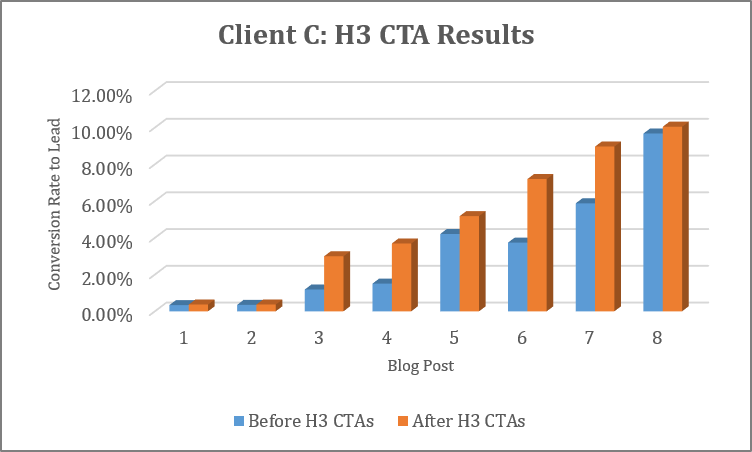 We created lists in HubSpot to monitor the number of leads that each post generated before and after the H3 CTAs were implemented, and below are our findings. We added H3 CTAs to five blog posts on June 7, 2016. Eight weeks before adding H3 CTAs, these five posts converted a total of 0.39% of viewers into leads. Two out of five of the blog posts saw an increase in conversion rate (two stayed the same). The five posts now convert a total of 0.43% of viewers into leads—a 10% increase in conversion rate as a result of the change. Although these conversation rates are small, the numbers add up quickly. Talk about a quick (and painless!) way to grow leads. We added H3 CTAs to 10 blog posts on June 24, 2016. Eight weeks before adding H3 CTAs, these ten posts converted a total of 3.18% of viewers into leads. Four out of 10 of the blog posts saw an increase in conversion rate (two stayed the same). The 10 posts now convert a total of 3.52% of viewers into leads—an 11% increase in conversion rate as a result of the change. We added H3 CTAs to eight blog posts on June 23, 2016. Eight weeks before adding H3 CTAs, these eight posts converted a total of 3.24% of viewers into leads. All eight blog posts saw an increase in conversion rate. The eight posts now convert a total of 5.17% of viewers into leads—a 60% increase in conversion rate as a result of the change. We saw the best results by far with Client C, and we attribute that to one main thing: they have the most offers. 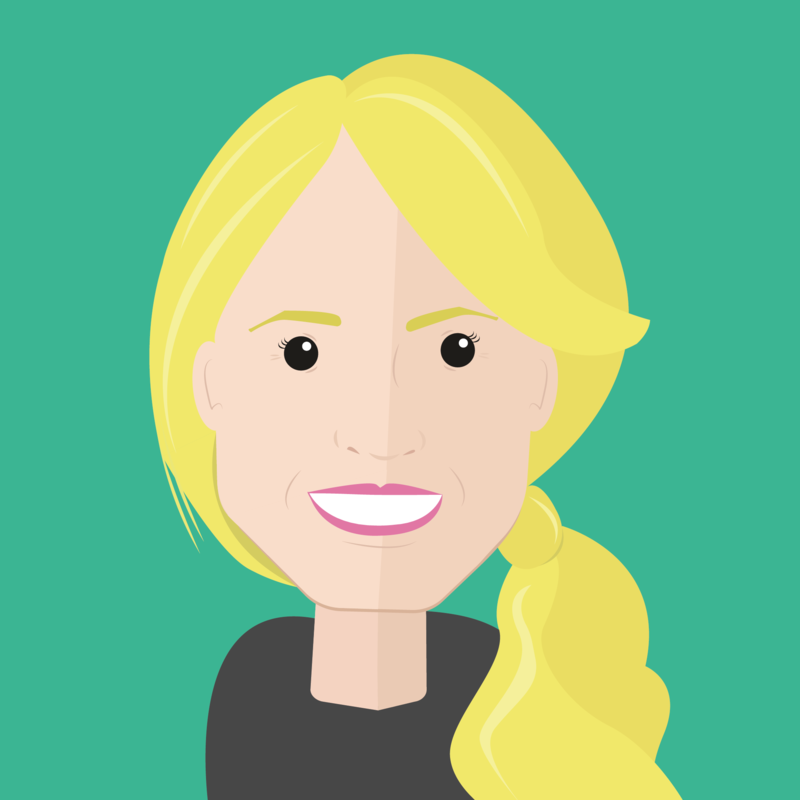 This client has almost 20 different guides, ebooks, and white papers, allowing us to insert H3 CTAs that are relevant to the topic of the blog post—therefore, they are of more interest to the reader. 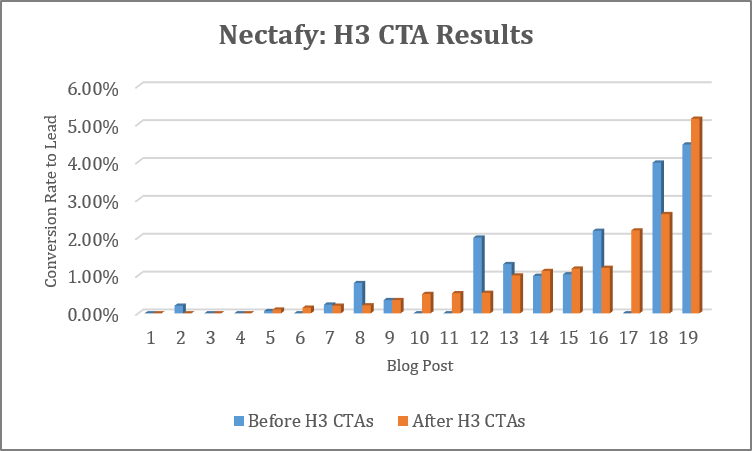 We added H3 CTAs to 19 blog posts on June 24, 2016. Before H3 CTAs, these 19 posts converted a total of 0.54% of viewers into leads. Eight out of 19 of the blog posts saw an increase in conversion rate (four stayed the same). The 19 posts converted a total of 0.47% of viewers into leads—a 14% decrease in conversion rate as a result of the change. Our H3 CTAs don’t stand out. After visually comparing our clients’ H3 CTAs to our own, we noticed that our clients’ heading three styling not only stands out from the rest of the blog copy, but the reader can also easily identify that the text is a hyperlink. The way our heading three text is formatted, however, makes the CTAs blend into the surrounding text, which may have made the clickable content difficult to differentiate for readers. We don’t have as many relevant offers. We do our best to deliver original and informative content on our blog at least 1-2 times per week, but with less than 10 offers, including a CTA that is directly relevant to the topic of a blog post isn’t always possible. To recap, we were able to increase three of our clients’ blog leads in just two months—a direct result of the addition of H3 CTAs! 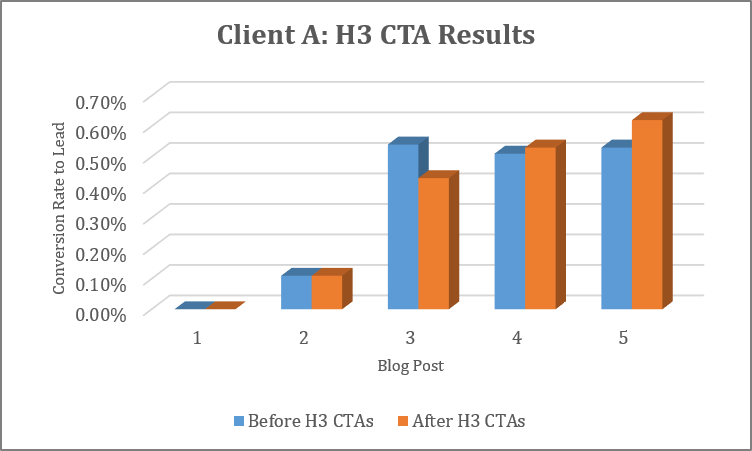 And we learned a valuable lesson when it comes to our own blog—to make sure our H3 CTA text stands out and can be easily recognized as clickable content. So if you’re like me and quick to resist change, just remember that inbound marketing is constantly evolving. Specifically, we’re seeing a change in how people react to the “designed” versions of CTAs—they’re simply starting to look right past them. If you want to keep up with the competition and see continued inbound success, you can’t fight what’s changing. Instead, you must learn to go with the flow, and chances are, whether you’re implementing different techniques or creating new holiday traditions, it will be worth it! 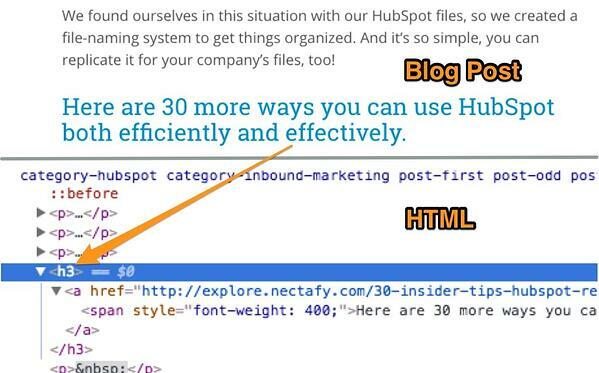 Have you recently added H3 CTAs to your blog posts or tried a new inbound approach? I’d love to hear how it went for you—leave me a comment below and let me know!